Verbatim’s teeny-tiny new USB memory stick (perhaps memory “nub” is more like it) adds up to 4 GB of extra storage space to your laptop—and it’s so small, you may well forget it’s there. On sale now in 4 GB ($20), 8 GB ($30), and 16 GB ($60) flavors, the Store ‘n’ Stay flash-memory drive is basically nothing more than five-millimeter-thick plastic module attached to a USB port. Yes, the Store ‘n’ Stay looks tiny—maybe too tiny. If one were to lose the itty-bitty thing in a junk drawer, you’d probably never find it again. 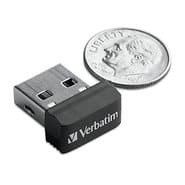 But the idea behind Verbatim’s miniature memory drive (good for storing anywhere from, say, 500 to 4,000 songs, or up to 5,200 photos) is that it’s so small, you could plug it into your laptop’s USB port and essentially keep it there. Nifty—although keep in mind that you can snap up a standard (if somewhat larger and bulkier) 16 GB USB flash drive for less than $30 on Amazon.